It’s likely that a previous tennis injury is to blame. TENNIS STAR SERENA Williams was spotted taking a taxi to the finish line of her own five kilometre charity run this week. The 34-year-old was seen jumping into a yellow cab around two kilometres into the race in Miami Beach. While the reason behind her decision not to complete the race is still unclear, it’s likely due to a previous tennis injury. The 34-year-old suffered injuries on her knee and elbow earlier this year and announced that she would be taking the rest of the year off in October. She’s currently ranked number one in the world in women’s tennis. 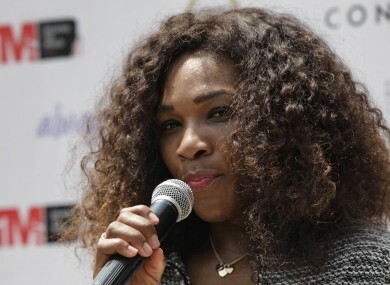 3,000 runners took part in the event, including Serena’s sister Venus. Email “Serena Williams got a taxi to the finish line of her own 5k charity run ”. Feedback on “Serena Williams got a taxi to the finish line of her own 5k charity run ”.